Presidential candidates Senator Barack Obama and Senator John McCain. 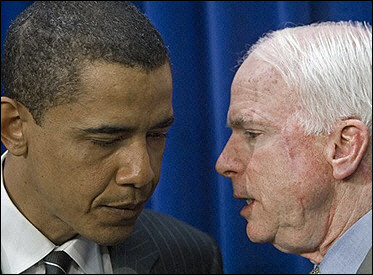 Senator John McCain or Senator Barack Obama. I asked a visiting Israeli the other day which of the two candidates for President of the United States is, from his point of view, better for Israel. And it reinforces the view that the debate about which of the two candidates is “best for Israel” is ridiculous. The one who is better for Israel is the one you believe is better for America. Of course, we are still going to hear the usual claptrap about who is more pro-Israel. And claptrap it is. Lately the mantle of “pro-Israel” is claimed by whoever is more right-wing on Israel. In other words, whichever candidate is more enthusiastic about the status quo is the more pro-Israel. Never mind that the status quo is horrific. Think about it. Iraq is now in the hands of a Shiite regime—allied with Iran—that the United States installed in power. The election the United States forced on the Palestinians was won by Hamas. The U.S.-Israel effort to isolate Hamas has failed. Hezbollah is the dominant force in Lebanese politics. Israel has to go it alone when it comes to negotiations with Syria because the Bush administration is, at best, indifferent to Israeli-Syrian negotiations. The United States (and/or Israel) could soon find itself at war with Iran because we ignored Iran’s offer to settle the grievances between us (including the nuclear issue) back in 2003 when the United States was strong and Iran was weak. And we are stilled bogged down in an unwinnable war in Iraq which will probably be followed by decades of U.S. occupation. Nonetheless, the pro-Israel right thinks the status quo is just fine. It is said that you can’t be too rich or too thin. You also can’t be too right-wing to please the most zealous single-issue types in the pro-Israel community. This does not apply only to politicians. Just a year ago, Pastor John Hagee addressed the AIPAC conference in Washington. He was hailed as another Moses despite his stated belief that the Holocaust was part of God’s plan to get the Jews back to Zion and his stated hope that Israel will be destroyed to bring on the second coming of Jesus Christ. The fact that Senator John McCain, to his credit, ended his ties to Hagee because of the man’s anti-Jewish views has not daunted some of the most significant Jewish organizations. They still embrace Hagee as if it’s okay to be anti-Semitic if you are pro-Israel. (I guess it’s also okay to favor Israel’s destruction so long as it’s in a right-wing or theological context). It should be clear by now that the “who is more pro-Israel” debate is entirely bogus. Both candidates have strong and consistent records of support for the Jewish state. Those who point to Israel as their reason for not supporting Obama or McCain respectively are not being honest. They do not like one or the other candidate for other reasons and are using Israel as a pretext. Pollsters say that voters are uncomfortable saying that they oppose a candidate because he is “too old” or African American, so they invoke something else. “I don’t trust him on Israel” is ever so convenient. In fact, it is so convenient that the Israel pretext is used every four years like clockwork. It used to be obvious what being pro-Israel required. In my AIPAC days, I worked for IL “Si” Kenen, who founded the pro-Israel lobby in the 1950s. He remained head of AIPAC right through the 1973 Yom Kippur War and, with a staff of eight, managed to secure $2.2 billion in aid to Israel to help pay the costs of that war. It was a huge sum. In fact, it established a benchmark still in place today. He called the aid package “Israel’s lifeline.” That remains true today. It is hard to imagine Israel surviving without it. He would be stunned to learn that in 2008 there are segments of the pro-Israel community that care only about speeches and are indifferent to the foreign aid package that keeps Israel alive. The Northern New Jersey PAC (NORPAC) is the largest “pro-Israel” political action committee. It says its “primary purpose is to support candidates and sitting members of the U.S. Senate and House of Representatives who demonstrate a genuine commitment to the strength, security, and survival of Israel.” Nonetheless, it endorses candidates without reference to aid to Israel. All that matters is right-wing rhetoric. NORPAC apparently does not care if the candidates it supports put their money where their mouths are; either way they get NORPAC’s money. Opposing foreign aid—and isolationism in general—has a long, if not proud, history in the United States. But why would a pro-Israel political action committee be indifferent to the one significant action Congress takes to support the people of Israel? Israel Policy Forum takes no stand whatsoever on the issue of Garrett’s re-election. The foreign aid package, however, is legislation we strongly support. Look, I’ll admit it. I don’t like the whole idea of single-issue PACs. The idea of supporting candidates with whom one otherwise disagrees over a single issue is anathema to me. But if one is going to play that game, one should play it with some intelligence. The Garret issue raises this question: If helping Israel survive is not the gauge of what constitutes being pro-Israel, what is? I’ll tell you what is. In the context of political campaigns, “pro-Israel” is what your candidate is. “Anti-Israel” is what the other guy is. In any case, it’s time to stop it. AIPAC is doing its part to quash the lies about Obama. It gave him (along with Senators McCain and Clinton) the opportunity to tell the pro-Israel community what he really believes about the Middle East. It provided the perfect platform for the Democratic candidate to make clear that the anonymous e-mails being circulated about him in the Jewish community are full of lies and libels. He was received with a dozen standing ovations. But there is a limit to what AIPAC, or any organization, can do. People just have to use some judgment. Supporting the status quo does not make a politician pro-Israel. Often it makes him the opposite. Reprinted courtesy of the Israel Policy Forum.